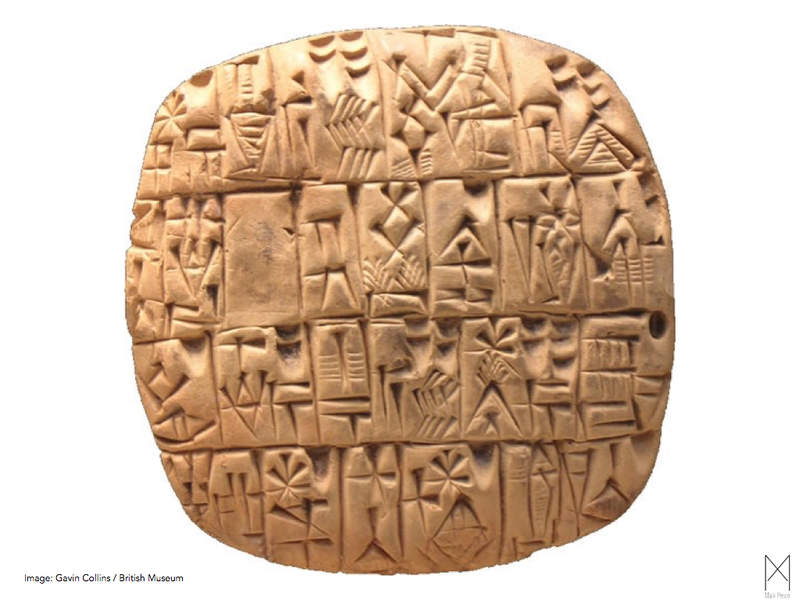 Writing has its origins in ledgers; counting money is the foundation of literacy — and civilisation. The first evolution of this talk began last year when I was invited to address the G20. That was very exciting — but what made it even more delightful was that I’d be able to go museum that houses an incredible range of antiquities from more than three thousand years of history. Including some of the very first coins. Around six hundred years before the assassination of Julius Caesar, the Lydians — who had an empire along the Aegean coast of Turkey — had become a crossroads of trade, connecting Egypt, the Middle East and Europe. Traders came through with wares from near and far. How do you pay a trader? You could pay them in kind — hand over a goat for some spices. But then the trader would be stuck with a goat, which isn’t very portable. So the Lydians struck the first coins from electrum — that’s a natural alloy of silver and gold — to give traders a portable store of value. Coins were an idea whose time had come — we know this because they were invented nearly simultaneously in both India and China, both rich trading cultures. Within a few hundred years, coins had found their way pretty much everywhere throughout Eurasia. For fifteen hundred years coins powered commerce. But by the 10th century, during the Song Dynasty — a golden age of Chinese civilisation — traders had grown so prosperous, they needed a store of value more portable — and lighter — than coins. Conveniently, the Chinese had already invented paper. So the Song merchants printed sheets of paper with the value of so many thousands of coins. Once the Imperial bureaucracy got wind of this, they made sure they controlled the presses that printed money. Marco Polo shows up three hundred years later, and informs Europe that Chinese use ‘money made from the bark of trees’. Within a hundred years the Europeans come up an invention of their own — double entry bookkeeping. We’re still using this system to keep track of assets and liabilities, because it’s reliable, transparent and reasonably error-proof. Europe at the end of the Middle Ages was a patchwork of kingdoms and principalities and bishoprics. There wasn’t really much central government, but traders moved freely between all these territories. Traders often had to move lots of coins from one place to another — expensive and not particularly safe. Banks — which began to form at around the same time — offered traders the opportunity to deposit their coins with bankers, receiving a ‘bill of exchange’ in return. This bill of exchange could be presented to another branch of the bank, in another city, and the same value withdrawn. The bill of exchange lights the fuse on the commercial explosion that begins the modern era. This is the point when money becomes more important than heredity. Those bills of exchange remain with us their modern form, as bank cheques. So the three forms of money that we’ve invented in the last twenty six hundred years — coins, paper money, and cheques — are all still with us. There’s only one more transformation in money we need to cover before we arrive in the present. This one kicked off fifty years ago. Back in 1965 IBM launched the System/360 — the first mainframe computer. Before the System 360 computers were highly customized, but IBM had the genius idea of creating a whole family of computers and accessories — things like printers and punched card readers and magnetic tape drives — that could be added as needed. This was such a good idea that within a decade IBM was the largest company in the world. IBM was then what Apple is today. Before System/360, nearly every bank worked from paper ledgers. It took lots of time and human effort to reconcile accounts. Within a generation nearly every bank of any size had an IBM mainframe and IBM software to manage its accounts. It took very little time and nearly no human effort to reconcile accounts. It’s just at this point in time that credit cards become popular. That’s not a coincidence. Managing the debits of tens and then hundreds of millions of users of credit cards, charging billions of transactions every month would be absolutely impossible and literally unthinkable before the mainframe computer. After the mainframe computer, credit is cheap, easy, and everywhere. Just a bit over eight years ago, with the launch of Apple’s iPhone 3G, smartphones came to Australia. It’s getting very hard to imagine what life was like before we all carried smartphones everywhere all the time. That’s how much things have changed. For all that they’re constantly in our hands, our go-to devices for almost everything, smartphones have remained curiously disconnected from the money economy. Yes, there are cool technologies like Apple Pay — but there’s not a whole lot of difference between Apple Pay and payWave and running your credit card through a mechanical imprint machine. All of the commerce on your smartphone — and there’s a fair bit of it these days, between music and the movies and Uber and so forth — doesn’t actually happen on your smartphone. It happens somewhere else — in a mainframe owned by your bank. Now that’s a funny point, because any smartphone manufactured in the last 2 years — which is most of the smartphones in this room — is nearly as powerful as any of the mainframes any of the banks are using to track all our transactions. The banks like to do the transaction processing for themselves so they can clip the ticket — charge the merchant a fee — and to guarantee the security of these transactions. Which brings us fully to the present. Around the same time as the Australian launch of the iPhone, a research paper described a new system for bookkeeping — shared ledger allowing anyone, anywhere, to study its contents. In themselves, shared ledgers are nothing new. When businesses have joint ventures, they often share ledgers — to track money spent and profits earned. This works best when the parties have just enough trust to work together, but not enough to allow them to blindly sign off on one another’s profit-and-loss statements. A shared ledger provides transparency, and transparency builds trust. This new shared ledger promised a lot more. It promised that everyone could share it, billing itself as a ‘distributed shared ledger’. How can that be? How can you trust people you don’t know and will never meet? What’s to keep them from altering the ledger in their favour? Let me explain how this shared ledger works, and you’ll see why it’s so difficult to corrupt. I’m going to use an example that’s a bit simpler than one you might find in the real world, but one that’s still very important to me — travel expenses. I travel a lot for business, and that means I have to very carefully track all of my expenses, so I can ask my clients for reimbursement. Over the last fortnight, I’ve been doing quite a bit of travel for a global accounting firm, so I’ve been keeping track of my travel expenses. My client expects me to submit an accurate accounting of those expenses. Transparency is very important to me, so what I’ll do is that as I get a receipt for a travel expense, I’ll put it in a public location, known to my client, so they can audit these expenses as they arrive. Let’s say I have four taxi receipts for trip from my home to airport, from airport to hotel, and back home again. Now that’s a complete block of receipts. It represents one distinct portion of the work. Now I do something a bit different — I place a signature on the block. The technical term for this signature is a ‘hash’ — but what you need to know is this: the signature is completely unique. If I change so much as one bit of information on anything within the block, the signature changes completely. So I place this signature into the block — and that’s block one done. We’ll put it aside. I do some more traveling for my client, and again generate four more taxi receipts, which I place into a new block two. But this time, before I put a signature on block two, I put one more thing into the block — the signature from block one. Remember, if a block changes in any way, its signature changes. It’s possible that someone could change the contents of block one, changing the signature too — and because they both agree, they could fool someone into thinking this is the real block one. But as soon as the true signature for block one goes into block two, you can’t do that. Tamper with block one and the signature for block one we placed into block two won’t agree with it. You’ll know — mathematically — that’s not the real block one. Ok, that’s block two finished, and we’ll put that aside. Doing some more business travel, I get four more receipts, which I place into a new block 3. This time, just before I add a signature to the block, I add the signature of block two. Block three has within it the signature of block two, block two has with it the signature of block one. I have created a chain of blocks — a ‘blockchain’, where every new link in the chain makes the previous links impervious to tampering. I can share this blockchain with my client, assured that they can’t tamper with any of my receipts, and they can share them with anyone they like — the ATO, or an auditor, or a client — and rest assured that everyone is seeing exactly the same information. This research paper actually went far beyond this simple example, describing a system where multiple parties could all contribute entries to the shared ledger. But, because of the mathematics of the blockchain, all could be assured the entries had not been tampered with. Trading is all about trust. If you can not trust you will not trade. The basic innovation of the blockchain is that it enables parties who have no reason to trust one another to engage in trading under a mathematically trustworthy framework. Let’s take a look at two applications of the blockchain that have been pioneered by Australian companies working to solve Australian problems. It’s here I hope you’ll start to see the real value of the blockchain. The first of these is a startup that I’ve been lucky enough to mentor over the last several months — Full Profile. The team who started Full Profile have a long background in agricultural commodities trading. But they’re farmers, too. One of the things they’d seen from their years of work is that farmers all too often often get the short end of the stick when it comes to payments. Full Profile fixes the holes in agricultural payments. A farmer grows a crop of grain, harvests it, transports it to a regional facility, where it’s weighed, graded and stored until someone buys it. Now you’d think at that point the farmer would get paid for the grain. The purchaser agrees to pay — but there’s a significant risk that won’t happen — or will happen a long time in the future. That grain could change hands a few times before it ends up at its final destination. Each time there’s a delay in payment. And in the worst case, if there’s a credit failure at any link in that chain, well, it’s almost always the farmer who wears that. The farmer won’t get paid for their grain — because somewhere along the way someone wasn’t completely honest about their finances. How do you know people can pay their debts? That’s not a new problem. It’s a problem bankers encountered seven hundred years ago with bills of exchange. Risk is one of the things you get when you have open agricultural commodities trading markets, as we have here in Australia. 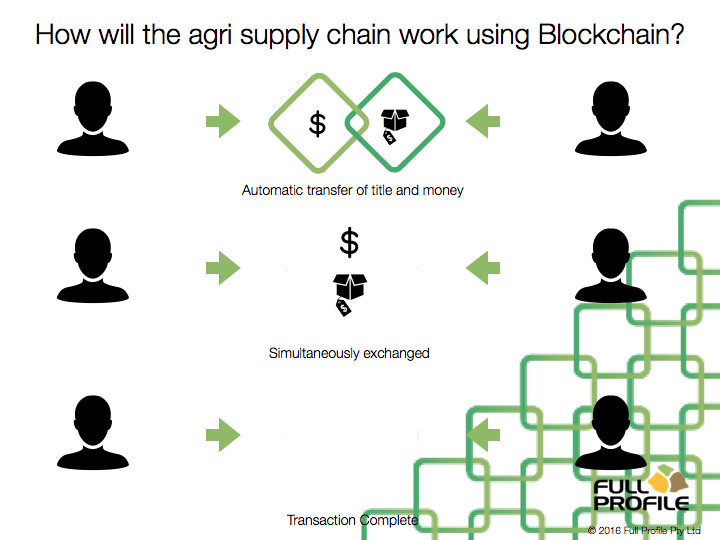 A commodities blockchain insures farmers get paid for their crop. 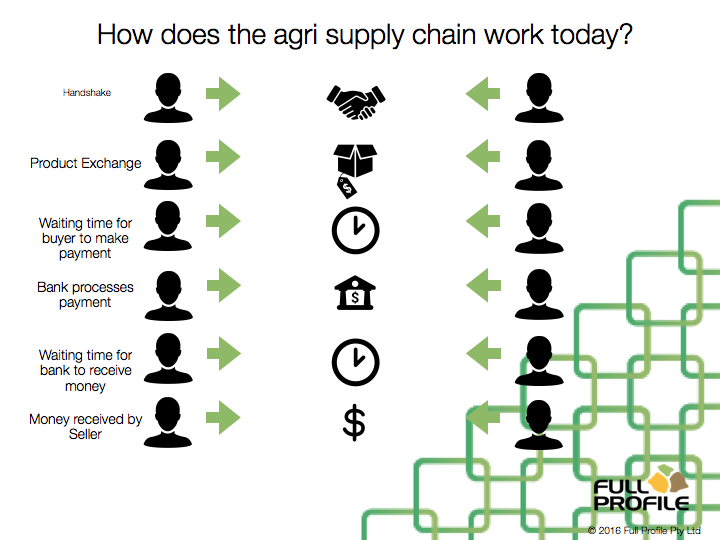 When a farmer brings their harvest to the facility, its weight and grade can be recorded in a blockchain — it’s an entry in a ledger. Any party who wants to purchase that grain can have assurance of both quality and quantity — because it is recorded in a blockchain. The goods for sale are authentic. A blockchain also means that a farmer can inspect the creditworthiness of the purchaser before the sale is made. A buyer has to prove they have the assets necessary to make a purchase. The blockchain acts like a ledger — not only is a harvest authenticated, but the books have to balance. And because the ledger is mathematically authenticated, you can’t cook the books. A sale of grain must be accompanied by a transfer of value from buyer to seller within the shared ledger. The farmer gets paid immediately, and the buyer gets exactly the product they were promised. Everyone wins. That’s what Full Profile is doing. If it sounds easy, keep in mind that before the blockchain it was effectively impossible to achieve this level of transparency between counterparties in an open market. So much depends on trust. Now, the counterparties can trust the maths enough to get on with business. And this is a multi-billion dollar business, both here and in Canada, where Full Profile just set up their first overseas office. Ok so that’s the first example of what a blockchain can do. The second one is a bit more homespun, and — given what happened last month — a bit closer to home. Over the last several years a most of the state governments have offered homeowners generous feed-in tariffs for the purchase of photovoltaic panels. Those tariffs helped pay for the installation of those systems — but now most of the states are dialing those tariffs back — and homeowners are looking for a better return on their investment. A Perth startup — Power Ledger — has created a application that allows home solar generators to sell power to their neighbors directly. The power providers get a better price for their energy, and the purchases pay less than they would if they bought it from the power utility. Everyone wins. Keeping track of who’s selling power and who’s buying it is handled by a blockchain, a distributed ledger shared among everyone using the system. Right now Power Ledger works best in strata complexes which have a single connection to the grid, but there’s no reason Power Ledger’s blockchain technology couldn’t scale up to statewide or even national power grids. And there’s no reason why the electric utilities wouldn’t adopt the blockchain themselves, in order to track of an electricity market where there are both lots of buyers and lots of sellers of power. So those are two homegrown blockchain applications. They’re both excellent ideas and good businesses — both part of the innovation economy we hear so much about. And you know what I think? It’s never been a more exciting time to be money. The original proposal of this research paper which described how blockchains work was to create a fully digital currency — money recorded as entries in a distributed ledger. Bitcoin is controversial. Bankers see it as risky. Central bankers see it as uncontrolled and deflationary. Law enforcement sees it as a way around all of the anti-money-laundering laws nations have put in place over the last twenty years. For its true believers, Bitcoin is the perfect currency, free from state interference, its only value being what people will pay for it. For them, it is Adam Smith’s invisible hand made manifest. But for all of the reasons I’ve just stated, there’s been a lot of resistance to Bitcoin. It hasn’t made the kind of headway its promoters expected, because it breaks too many rules. One of the best things about Bitcoin is that it allows to parties to trade freely — even when they don’t trust one another. The blockchain makes that possible. And that’s a feature we need to bring to money. Over the last few years some of the biggest central banks around the world — the US Federal Reserve, the People’s Bank of China, and the Bank of England have all had chance to play with the blockchain. Central banks handle settlements between banks — and a blockchain is a great way to handle that. Just as Full Profile handles settlements between farmers and buyers, a blockchain can be used transfer settlements between any two large financial institutions. The central bank needn’t be directly involved — all they need to do is give it their blessing. We’re already starting to see this in international transfers between banks. Right now there’s an organisation — SWIFT — which handles all of those transfers. But SWIFT is bureaucratic and expensive — and has been hacked for hundreds of millions of dollars in the last year. So the banks are developing a blockchain that will do much the same thing — more securely and much cheaper. So that’s the banks sorted. But the other job of a central bank is to make sure the currency is sound. And it is, but there’s a problem with money — it’s become tremendously hard to use. Right now we have three forms of money: the coins and bills we carry with us, the cheques we can write — but rarely do any more — and credit cards. All of them were really useful in the last century — even up to about 10 years ago. We tend to forget that the iPhone was only launched in Australia eight years ago. At this point something like eighty five or ninety percent of all adults have a smartphone, and most of them have it with them pretty much all the time. It’s huge. There’s never been a transformation like that — so fast and so complete — in the history of human civilisation. And within the next three years, around eighty percent of all adults everywhere on Earth will be using a smartphone. So this story isn’t just about Australia. It’s happening everywhere. The smartphone is everywhere. But smartphones and money exist in separate universes. Right now you have to have an account with Apple or Google to purchase apps — they handle all of the credit card processing. If you order up an Uber, Uber has to have your credit card details, so they can bill you for your ride. Anything on your smartphone that involves money, also involves a series of other institutions that handle the nitty gritty of moving money from one account to another. They’re getting paid a very nice fee — for little more than making changes in a ledger. We need all these intermediaries every time we try to do any transaction with our smartphone because we don’t have any form of money both digital and stands on its own in the same way a coin or a bill does. That’s the next stop for money. Twenty five hundred years ago the pressure of trade forced the minting of the first coins. 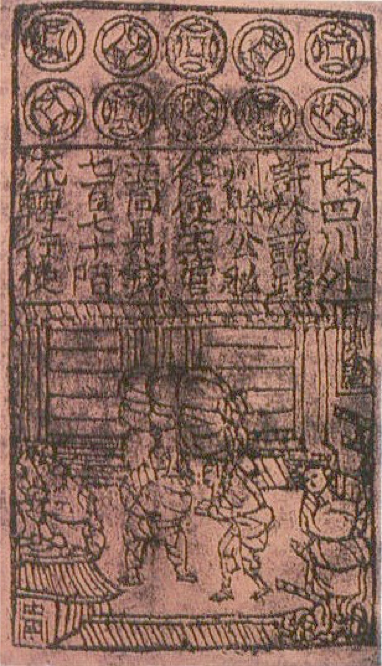 Eleven hundred years ago the weight of all those coins forced the printing of paper money. Seven hundred years ago the challenges of international trade forced the development of bills of exchange. And fifty years ago the mainframes gave birth to the credit revolution. Right now we’re on the cusp of a similar revolution. Because our smartphones want our money. They don’t want to have to talk to a bank for an authorisation. They just want to hand over the cash. But they can’t, because we haven’t got money that fits into a smartphone. Yet. Sometime in the next few years, one of these big central banks is going to introduce its own blockchain-based money — blockchain money issued by a government. The banks won’t be afraid of fedcoins. Nor will the regulators or law enforcement — because we already have plenty of laws to regulate money, and all of those laws will apply to fedcoins. But when that blockchain based money lands inside a smartphone, the whole world is going to change. Why? Because fedcoins allow money to move around inside your smartphone — between apps — and between smartphones. Quickly and simply. There are a whole range of things we can’t do with our smartphones because they involve transactions — credit card fees — that are too high to make it profitable unless we’re moving things in dollar units. But when you have a fedcoin in your smartphone, you can pay a tenth of a cent — maybe to watch a bit of a live concert, or a lecture, or what have you — and it just works. But that’s only the beginning. Smart folks will figure out how to get the apps billing one another. One app can pay another app for services rendered. That may sound weird when it’s happening on your smartphone, but it’s already how the entire economy works. We produce products and services for sale; we consume and pay for the products and services of others. All of that works because we have a money economy. So if it works that way out there, why wouldn’t it work that way inside your smartphone? Why would it be any different? The money economy is going to live in each of our smartphones. Each of them will become a handheld reflection of the economy as a whole. And when you’re not using your smartphone, it’s still going to be plugging away, making your money work for you. Your smartphone is going start to act a lot like a bank does today, managing the money you’ve loaded into it, busy both earning and spending money. Smartphones are already more than smart enough to do this — and where they’re not they’ll connect to smarts out there in the cloud, get some advice, and put that advice to work. All of that will happen without you being aware of it — the only thing you’ll do is install the app that best fits your needs. And if the banks are smart, they’re already at work on those apps, so they can keep you as customers in the years to come. A fedcoin is coming. Hard to say where or when, but the disconnect between smartphones and money makes it inevitable. We need fedcoins to close the gap. The energy released will spark a new cycle of growth in the global economy, similar to the one we saw twenty years ago, when the Web took off. But much, much bigger. But we’re not done yet. Oh no. A blockchain can be more than just bookkeeping. A few years back, two bright young engineers dreamed up a blockchain that could also record computer programs. They called this blockchain ‘Ethereum’ — and it’s been up and running for the last six months. Ethereum creates a ‘smart’ blockchain — a blockchain that is also a computer that’s running lots of little programs. A good example of one of those programs is an escrow agreement — an agreement to pay funds on deposit with a neutral party as soon as certain conditions have been satisfied. Ethereum allows you to write a program to test for those conditions, and — if the conditions have been met — the program makes a change in the blockchain, moving funds from one side of the ledger to the other — without any human intervention. That’s called a ‘smart contract’. When we get fedcoins, we also get smart contracts. Probably not immediately — it’ll take some time for people to be comfortable with fedcoins, and while finding that comfort zone, we’ll want those fedcoins to behave like money as we’ve always known it. But once we’re good and comfortable with our fedcoins, the world will change again. We’ll start adding these computer programs into all of our fedcoins. Our money will no longer be passive or dumb. It’ll be smart money, actively working every moment to increase its value, and to serve whatever ends you decide are important for you right now. It’s difficult to describe what that world of smart money is like, because we really don’t have any experience of a world where money is thinking for itself. It obviously means that some money will come with restrictions on how it can be spent or invested. Some money might insist it can only be used in ethical investments — and it will have its own set of ideas about what those ethics are. Gift money can only be used in certain shops, or for certain items — the way we use gift cards today. But I get the sense that’s just scratching the surface. There are so many possibilities inside the idea of smart money my head starts to spin when I think of what might be possible. The next twenty years will see more changes in money than we’ve seen in the last twenty centuries. The money economy we’ve grown up in is on the threshold of a transformation that will also transform everything touched by money. The smartphone arrived in late 2007. 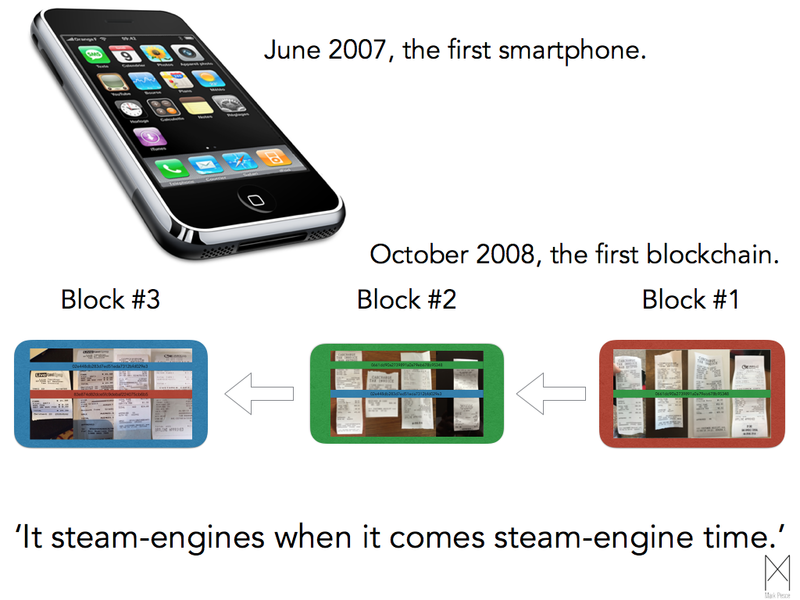 And the blockchain arrived in early 2008. That’s one of those weird accidents of history. Simultaneous invention of technologies that were always meant to be together. And will lead to the biggest thing we’ve seen in our lifetimes. This talk was delivered at the Adelaide Festival of Ideas, 22 October 2016, and is published here with their permission — and with my thanks! VRML co-inventor, author, educator, entrepreneur & podcaster. Founded programs at USC & AFTRS. Columnist for The Register. MRS. Next Billion Seconds. MPT.